Ed. Note- Yeah, we know we're a little late on this whole "best plays of 2014" thing, but our buddy Andy put together a great list for you all, and I didn't want a little thing like "timeliness" to ruin it. Click on all the links to watch video of these memorable plays. One second remained when this play began, and Central Michigan was nowhere near the end zone. The play started with a Hail Mary, and even when that was caught, the Chippewas were still 30 yards away. A series of laterals finally allowed them to score a touchdown on the crazy play. Unfortunately, they missed the ensuing two-point conversion and lost the game by a point. The Bruins’ rookie made an incredible effort throughout this play. He started by blocking a shot. Then he hustled down the ice to split the defense. He got twisted around but still managed to get a shot off backwards and between his legs for the goal. This was the run of the year in the NFL. Lynch made a few defenders miss near the line of scrimmage, then he burst outside and made Patrick Peterson look silly, trucked through another Cardinal and took it all the way for the score. Wall got hauled down to the floor with an obvious foul, but he still managed to throw up a circus shot that fell in from an impossible position. This goal came late in extra time and clinched the World Cup for Germany. Regardless of the situation, it was a really nice goal. Blues’ forward Vladimir Tarasenko skated through practically the entire Rangers’ defense and then finished beautifully. He scored with one hand using the move Peter Forsberg made famous when he scored the winning goal in the 1994 Olympics. But Forsberg pulled off the move in a shootout while Tarasenko had to contend with an entire team. It looked like Florida Atlantic had the play well defended, but Nebraska’s Jordan Westerkamp made an unbelievable reaction to the tipped pass and adjusted to catch the ball behind his back while staying in bounds along the sideline. The commentary says it all. Ennis’ ability to stay with the play after jumping past the mouth of the goal was remarkable. Getting his no-look backhand on net was hard enough, but he found the back of the net. What happened on these two points looked like something out of an exhibition, but it was from an actual ATP tournament. Dimitrov pulled off a shot behind his back immediately followed by one between his legs, both for clean winners off of blistering returns by Jack Sock. 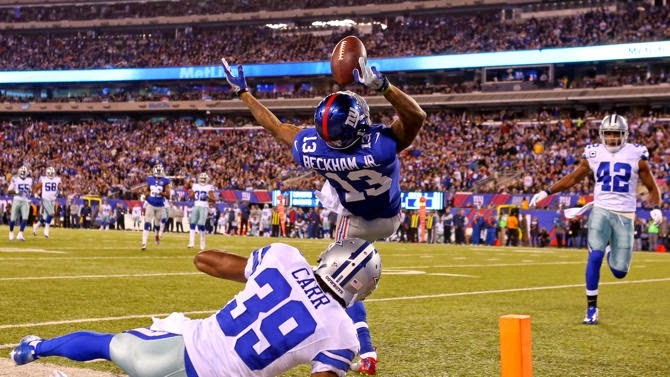 This catch transformed the Giants’ rookie receiver from a virtual unknown to a household name overnight. His defender blatantly committed pass interference, but Beckham hauled in a 50 yard pass anyway, using only three fingers to do it. Many analysts, players, coaches and fans called it the greatest catch of all time, and it’s hard to argue.